The MCR exposure and training course held in Cameroon at the end of August was able to build upon a solid base at COTECC, a technical training college in Bafut, in the North West Highlands of Cameroon. Their MCR Development Program of which this MCR exposure course forms part, arose out of a long collaboration between the Meilen-Bafut Foundation in Switzerland and COTECC, a technical training college in Bafut, in the North West Highlands of Cameroon. MCR technology was introduced to this region through COTECC in 1990, involving a training course and the technology transfer of a tile-making machine with 200 tile moulds. In the ten years of the COTECC MCR workshop´s existence it has supplied tiles and roofed a large range of structures in the region, from ambitious large scale structures at the Fon's (king) palace, to complex red cement tile roofs on some 'private palaces', classrooms, people's houses, etc. Outcomes from the transfer of one tilemaking machine and 200 moulds to the region have multiplied many times. In 2000 Mr. Paul Tamnjong, the COTECC Principal attended an MCR exposure course in Harare facilitated by Grupo Sofonias, which drew participants from Malawi, Zambia, Mozambique, Namibia, Democratic Republic of Congo as well as Zimbabwe. The workshop sessions were coordinated by South African architect Peter Dunckley, and Paul was able to contribute greatly from his long and wide experience with MCR in Cameroon. He then took responsibility for the regional organization and co-ordination of a similar Course in Cameroon. At the EcoMaterials Conference in 2001 which drew participants from Latin America, Asia, Africa and Europe, Dr. Uphie Chinje Melo, a Cameroon university professor, was able to meet many of the key players with regard to MCR technology, among them Dunckley. Thus, she and Peter were able to coordinate along with Paul the exposure course in Cameroon. Madame Melo is Director of MIPROMALO (Mission for the Promotion of Local Materials of the Ministry of Technical and Scientific Research) and arrived with Mr. Ndigui Billong a materials chemist and researcher with the Mission, who co-facilitated the workshop sessions for the two week period. Provide an overview on the technology and its market potential. 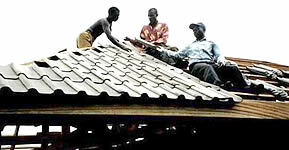 Establish good practice in production, quality control and roofing. Integrate existing producers and newcomers to achieve a uniform good level. The actions organized included a first seminar that concentrates on the theoretical and analytical issues but gives a practical overview and some instructions on production, quality tests and roofing, as well as a practical follow up (training session) that is workshop oriented and concentrates on production and testing but includes some theoretical information. The social culture and character of commerce in the region reflects a high level of entrepreneurial skills, with a large proportion of employment taken up in small and medium scale enterprises. Thus, the participants have strong 'business planning skills', along with strong leadership, important as initiative and skill in the planning and management of MCR enterprises is a key factor in their ability to sustain and grow. The participants decided to set up a network. An active subregional mcr producers network involves people co-operating actively together to meet their needs as MCR producers - and to gradually increase and improve local production capacity, tile production and roofing competencies, tile quality, customer services and market share. The MCR Exposure Course has put in place a Regional MCR Producers Network with a clearly defined range of objectives, an elected leadership collective empowered to take forward Network programs, and an administrative base with effective leadership and financial accounting capacity. The theoretical and practical MCR capacities of a core pool of existing skilled MCR producers and trainers in the region, have been enhanced - and an overall understanding of the technology extended to a larger pool of people active and influential in key sectors of the social culture (technical colleges, business, MCR workshop managers, contractors, builders).